Recently I visited a stunningly beautiful home. Paintings on the walls included several Renoirs and a Monet. Antique porcelain and decorative treasures filled the rooms. Two collectors had spent their lives acquiring artwork to grace their home, now a museum. As I walked through the rooms, I was awed by how the owners used their expertise and invested their wealth to curate such lovely objects. You and I may not be art collectors, but we can make investments to create more beautiful homes and lives. The word “house” refers not only to the place we live, but also to our life. 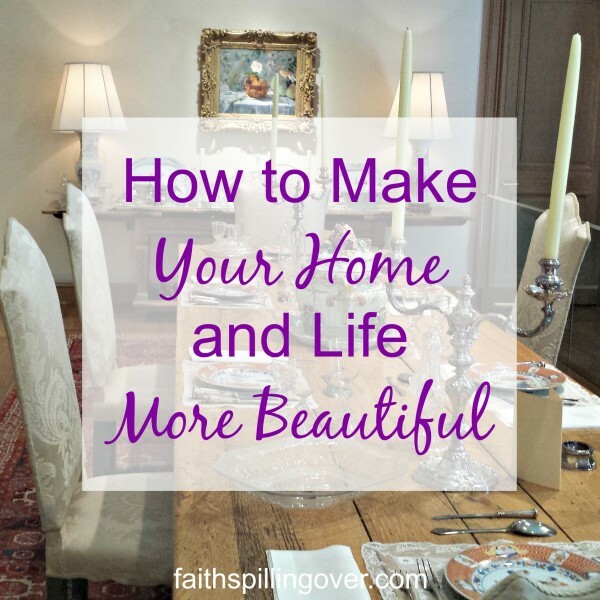 Over time, wise investments in our marriages, families, and homes create beauty. 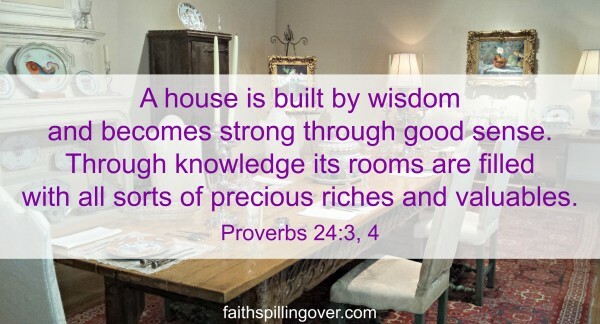 When we live by it, God’s wisdom yields valuable treasures and blessings. You are a powerful influence in your home, and you’re the only person you can control. Spend time with Jesus each day. He’ll give you the wisdom, strength, and joy you need to shine His light. 2. Honor Your Husband First. After God, put your husband in first place, before your kids, job, or ministry. Respect his leadership. Be attentive to his needs. Give time to your most important relationship. Let your children see you live out the Christian life you want for them. Read scripture together. Go to church and serve God together in your community. Pray for yourself and your family to ask for God’s blessing and guidance. Make Christ the center of your home by praying together daily with your husband and your children. I struggle with this. Just last night I snapped at my daughter for one tiny $20 mistake. Let’s ask God’s Holy Spirit to help us curb words of irritation and speak positive, hopeful words instead. Play with your kids, take walks, and go out for ice cream. Be a listener. Welcome guests of all ages into your home. Pay attention to what your husband and kids do well, and tell them you appreciate it. Be a positive voice. Cook up some good food. (Or pop frozen dinner into the oven.) Have friends over for a meal when you can. Family dinner will have a greater impact on your kids than just about anything. Create an environment of beauty by taking time to clean, de-clutter, and organize your home. Fifteen to twenty minutes a day works wonders. Redeem housework by praying while you do it. I don’t mean to suggest that we have to be Super Women to invest wisely in our homes. None of us will do all of these each day. You might cook a delicious meal one evening and bring home takeout the next. Some days I fail at honoring my husband or modeling faith well to my children. I have to ask for forgiveness. But if we seek to put God first and return to His wisdom again and again, he’ll make our lives more beautiful. Now it’s your turn: What treasures do you want for your home? If you’d like fresh servings of Faith Spilling Over delivered weekly to your inbox, enter your e-mail address in the box in the sidebar. I’d love to send you my free guide, 10 Days to More. You’ll find 10 ways to study and engage with God’s Word. I’m linking up with Holly Barrett’s #TestimonyTuesday, Kelly Balarie’s #RaRaLinkup, Holley Gerth’s Coffee for your Heart, Crystal Storms’ #HeartEncouragement, and Arabah Joy’s Grace and Truth. Check out these communities for more encouragement. I love the balance of this post. Thanks for making room for everyone to be a “home maker” in the best possible sense. Some of us are good cleaner/organizers . . . some are wonderful cooks who can produce glorious meals. Few of us are BOTH. It’s good to use short cuts when needed with the idea that the end result is not our own glory, or a Pinterest perfect house, but an environment that fosters Christ-centered living as a family! I’m always blessed when I come to your place, Betsy! Thanks for your thoughtful comment, Michele. I really appreciate it this morning. You’re right: we want Christ-centered living for our families. THAT makes life beautiful! This is a really great article thanks. Practical faith is what makes the world take notice of our testimony. Thanks, Lily. Appreciated your sharing this today. Thanks for your encouragement here, Kristi. You are a light yourself, friend! May His light shine in our homes, yes? Oh yes, we do mess up and need His grace. I do more than anyone! Betsy, I visited a beautiful home recently too and it left me feeling a little inadequate about mine. Thank you for this timely reminder about what truly matters. I had never read that verse from Proverbs before. What a gem! Oh, I know that feeling of inadequate! I’ve never been much into decorating, organizing myself. I guess the museum house was so over-the-top that I didn’t even THINK to compare mine with it! Glad you’ve been introduced to this verse. speak life, be an encourager. usually, women set the tone of the home. and only by His grace can we live out what we believe in the dailyness of all that comes at us. Thanks, Linda. Yes, we do set the tone for our homes! May God bless you and make you a light to all around you! Thank you for sharing, Betsy. Have a blessed day! I think family dinner has been one of the most important thing we’ve done with our kids for sure! Glad you’re able to do it too. These are great thoughts, Betsy. It’s lovely to have nice things and to make our homes beautiful in a physical way, yet the spirit of our home is so much more important. You’re right that we are the only ones we can control — something I need to remind myself of often! Hi Betsy! 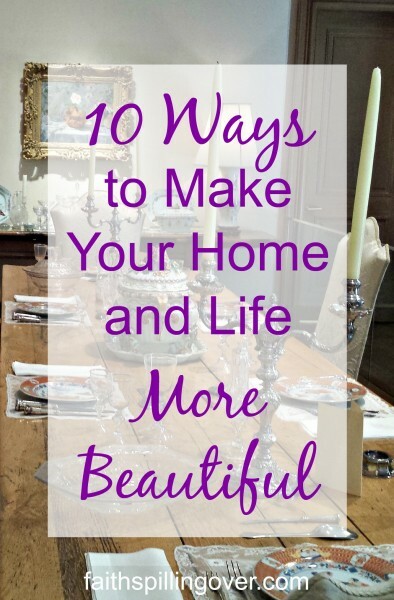 I like your list for making a beautiful home. I especially appreciated the music, and prayer aspect. I think that I try to keep up with cleaning, but it seems like a never-ending job. And I don’t have children here anymore! One way to keep my home beautiful is by making time to be with my husband each day. We have lives that go in two directions, so having that time at the end of the day to talk is really important. It’s important to remember that beauty comes from relationships and from the physical space! Great practicality here, Betsy. I know that I become a grumpy gal when my home is chaotic – I can’t do any of the ten when there is mess all around me. I truly find that my home is more peaceful, my time with the Lord is more fruitful, and I’m an all around nicer wife and mom when I take a bit of time to get things in their proper place – of course, my heart counts too. Hugs, friend. “Grumpy Gal.” That makes me laugh, Tiffany! It’s true that order around us helps us order our hearts on the inside. Thanks for reading today, Bethany. Lifting up a prayer for your home now, friend. Great suggestions, Betsy. I think the ones I struggle with the most are remembering to speak words of life when I’m upset or tired and being diligent to clean up. The house is clean, but the piles? Let’s just say there are lots at the moment. Oh, I have some piles around here too, Jeanne. Not always, but today I do! Praying for us both to speak words of life. I love this list, Betsy. It reminds me of my mother-in-law. They never had a big house with rich furnishings but she was so hospitable and always made her home so welcoming that it was a beautiful place to be. Love this! How wonderful that your mother-in-law was such a great role model. A welcoming house is such a blessing, no matter what the furniture looks like! I love it that you wore out your kitchen table, Bev! Family meals were a blessing for us too, Bev, and still are, even with 3, just one child at home now. As we prepare to move to our new home I am thinking of all the the things I want it to be. This list is a great reminder of what is most important! Visiting from Coffee for Your Heart. Betsy, I love our home and I think by now your ten steps are finally in daily practice around here!!! Neighbor #61 at Holley’s. Great tips, Betsy! I struggle with spending time with my family. Once they hit the teen years and had jobs and cars and varsity games, life got a lot more difficult! I ended up having weekly dates with each of our girls, and this helped a lot. Now that they’re out of the nest, I need to making dating my husband a priority–he has a crazy busy schedule. Wow, weekly dates with your girls sounds great. I know what you mean about how it gets harder to spend time with your teens. I had the blessing of home schooling, which helped with that, but after school, they’re all over the planet! Hi sweet Betsy! I love the music reminder. What a fun one that is. I find it instantly cheers me up. This is a great list. Visiting from Susan’s site today. XOXO Have a great weekend. Hi there, Kelly. Yes, nothing cheers and lifts the spirit like MUSIC! May your home be full of it! These are such insightful tips, Betsy! I love how you said we don’t have to be superwoman- but step by step as we put God first He will make our lives more beautiful! That brings such rest to my soul. Sometimes I can get bogged down by the “I have to’s”. It’s really not my work, but my obedience to rest & rely on Him that brings the beautiful life! Thanks for sharing this today! Betsy love your comparison and yes those are beautiful truths and the only ones that can truly make a happy home. Thanks so much, Debbie. Have a great weekend. Betsy, I love these well thought out, practical tips. It can be a bit intimidating to see some other homes with all the fancy decor. What really matters is not all the ‘stuff’ but the things you’ve mentioned here. My prayer is to focus on putting God first, then my husband & my family and to use my home to influence others for Him — that’s what will make my house a home. Amen, Marva! That’s a great prayer. God first, then husband and family. May He fill your home with blessing as your light shines there! I appreciate these tips, Betsy. Number 9 is one of my favorites – and I needed the reminder to make relationships a priority. Too often I get caught up in my “to-do” list rather than the people I’m “to-doing” for! 🙂 Thank you for sharing your wisdom with us at Grace & Truth. You’re a cherished part of our community! I hear you, Jennifer. That is a challenge for me too. I have to remind myself to SLOW DOWN! Thanks for visiting from Grace and Truth today!